Margaret preparing coils to construct a vessel outside her home. 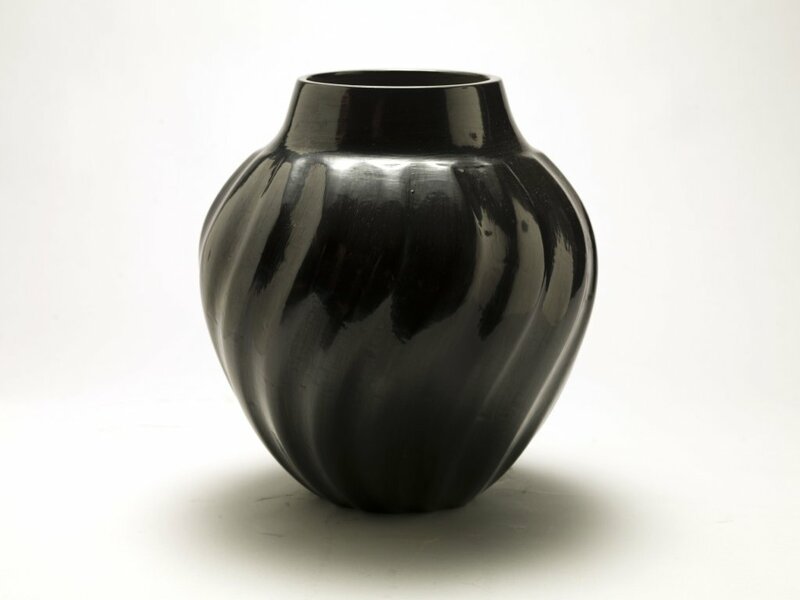 Margaret Tafoya was one of six extremely influential American Indian pottery matriarchs who raised her family into an understanding of the craft. Native American women have been making pottery for over 2,000 years and fired clay is the only natural material on earth that does not change over time. The longevity of this process and the properties of this material symbolize the passing down of information from one generation to the next by the gifted matriarchs who raised their families with the intent of preserving tradition, technique, and spiritual meaning. The enjoyable but arduous process of Native pottery involves the whole family, but making the vessels was long considered to be a women’s art form. 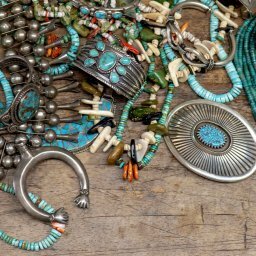 Native women, through the expansion of traditional and artistic techniques, have sustained this important cultural element and utilized it as a vital economic resource for their families and communities. Margaret Tafoya, never aware of her celebrity, was only quoted as being thankful to ‘Mother Clay’ for bestowing gifts that allowed her to take care of her family, and allowed her children to grow up and have families of their own. 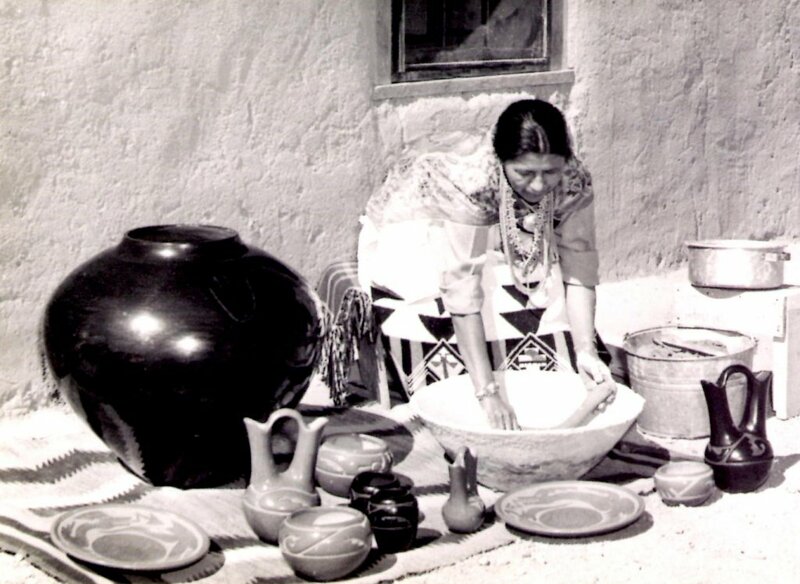 Beyond the perfection of her dignified ceramic forms and the dedication to the traditional pottery-making process, Margaret was a passionate, giving Mother who never once stopped trying to give her children and her pueblo the love, nourishment, and information it needed to thrive past her time. It is said that to own a piece of Margaret Tafoya pottery is to own a piece of history, but it also means that you hold the future. It is not just the immeasurable beauty of her large storage jars or the elegance and refinement of her aesthetic, her true gift is the link she maintained between the old way of life and the new. 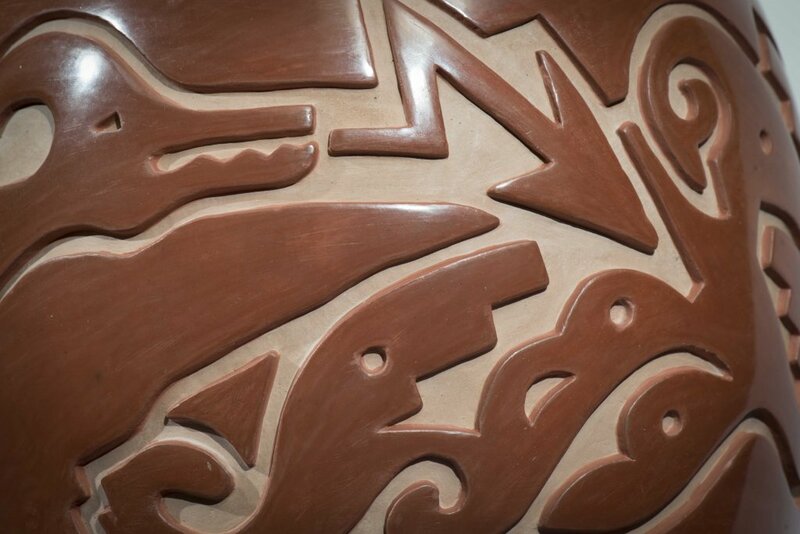 Over six generations of tradition lie within the pottery of Margaret Tafoya’s descendants, and to this day the process of making pottery continues as it did when Margaret was a child learning from her mother Sara Fina Tafoya. Sacred clay is dug out of the ground on Pueblo land, dried, ground, mixed with water, and then kneaded until the consistency is perfect. Pigments are sourced naturally and processed by hand, and each piece of pottery is coil-built, coated with slip, stone polished, and fired with wood and/or dung to achieve the desired coloring and shine. To deviate from this traditional process with the use of electric kilns and non-native clay would be a great dishonor to Margaret and the cultural traditions she devoted her life to maintain. At the time of her passing, Margaret Tafoya had a legacy of thirty grandchildren, forty-five great-grandchildren, and eleven great-great grandchildren. Eight out of 10 of her children became accomplished potters, with some being able to replicate the difficult task of constructing traditional large storage jars. Margaret began absorbing the history of over 1500 years of pottery making by the Tewa people observing her mother when she was a little girl. 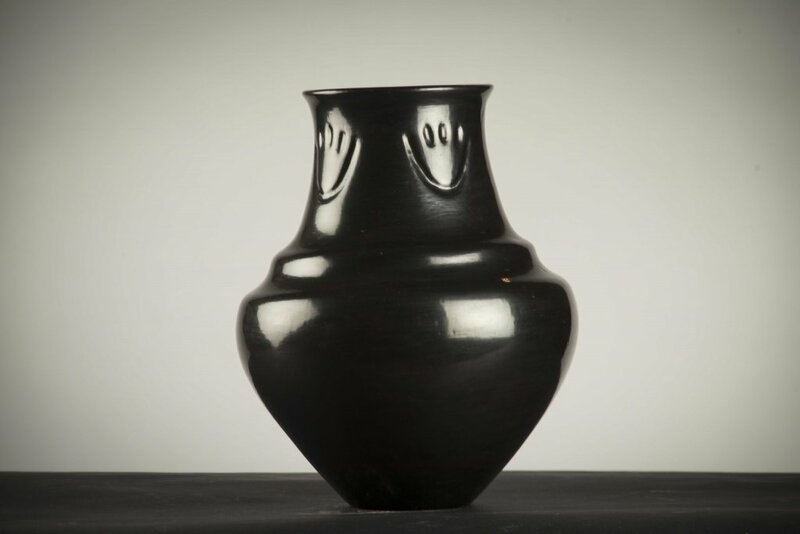 At this time in the early 1900’s, native potters reveled in a profound spiritual connection with the clay referring to it as “Clay Mother” – the spiritual guardian of the clay and the pottery making process. Connections like these were cherished and defended at a time when Pueblo culture and beliefs were under continual attack by new inhabitants of the North American continent. Margaret made her own serious connection to this spirit and often said to her children “listen to the Clay Mother, Mother Clay is shaping the pot.” In 1918 while Margaret was attending boarding school in Santa Fe, the eldest daughter of the Tafoya family, Tomacita, was a victim from the influenza epidemic, bringing Margaret home to help take care of her parents. 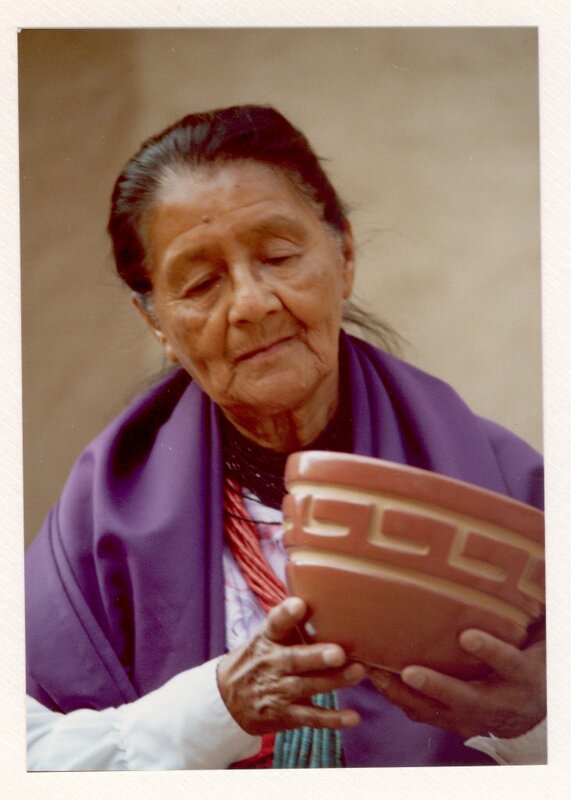 During this time she worked as a waitress and then as a cook until she was sought after by Alcario Tafoya and married him in 1924 beginning a 71 year-long marriage and journey influenced by an adherence to native pottery, culture and traditions. 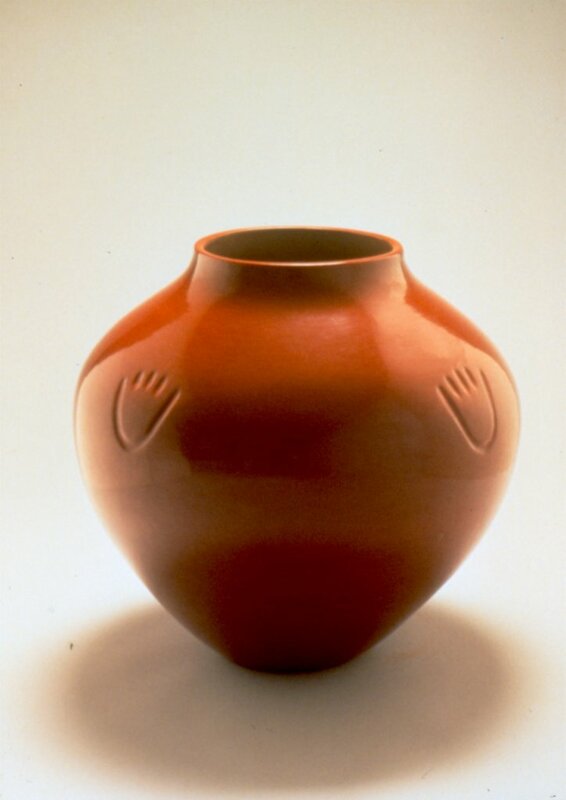 Until the arrival of the Santa Fe Trail in 1821, Native pottery was created for utilitarian purposes such as carrying water and preserving food, while ceremonial and spiritual objectives dictated design elements. 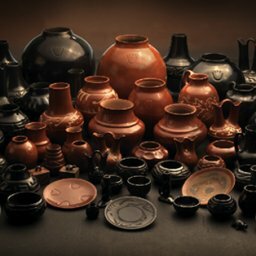 The opening of the Southwest to tourists, explorers, and new inhabitants brought the selling and trading of metal, stoneware, and china to the region, marking the first stage of decline for Pueblo pottery. 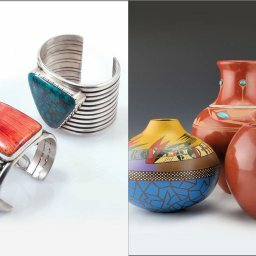 When the Santa Fe Railroad was completed in 1885, it marked the end of most handmade utilitarian pottery replaced by cheaper, long-lasting cookware and glass bottles. Tourists and people traveling through the Santa Clara Pueblo were not interested in larger forms of pottery as they would have been difficult to transport. 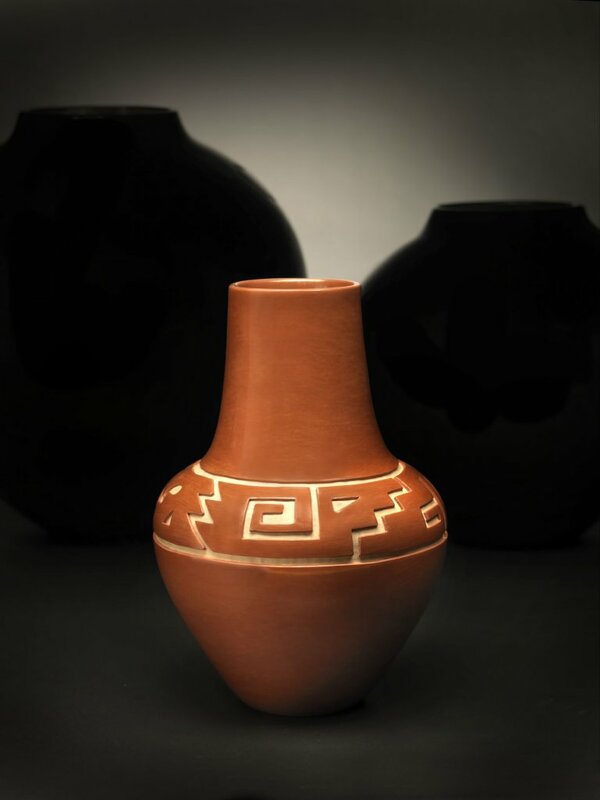 This expanded the decline of traditional Pueblo pottery and by 1900 very little pottery of any size or consequence was being created by the native people. It was a small handful of potters, Sara Fina Tafoya and her sister Santana Tafoya among them, that preserved their cultural customs and continued to handcraft vessels of exceptional size and capacity through the time-honored ways. 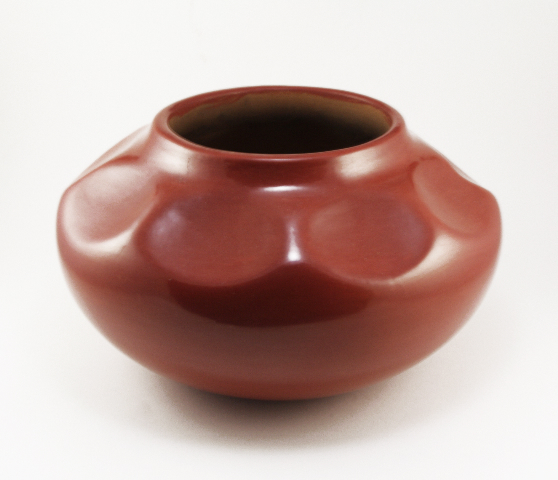 Part of the Tafoya pottery legacy is the continuation of large storage jars reaching 20 inches or more in height. 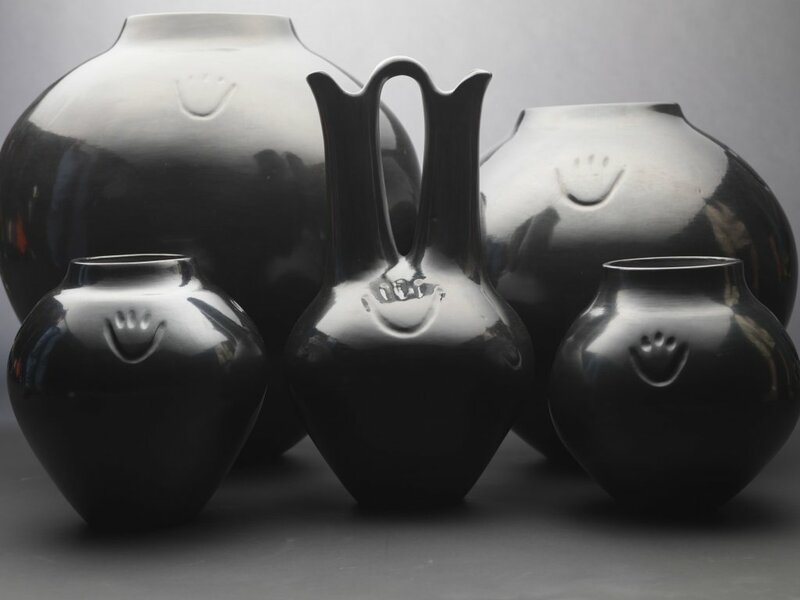 These jars are technically very difficult to construct, and it takes a dedicated, talented artist to compose a piece of this size with perfection and elegance. 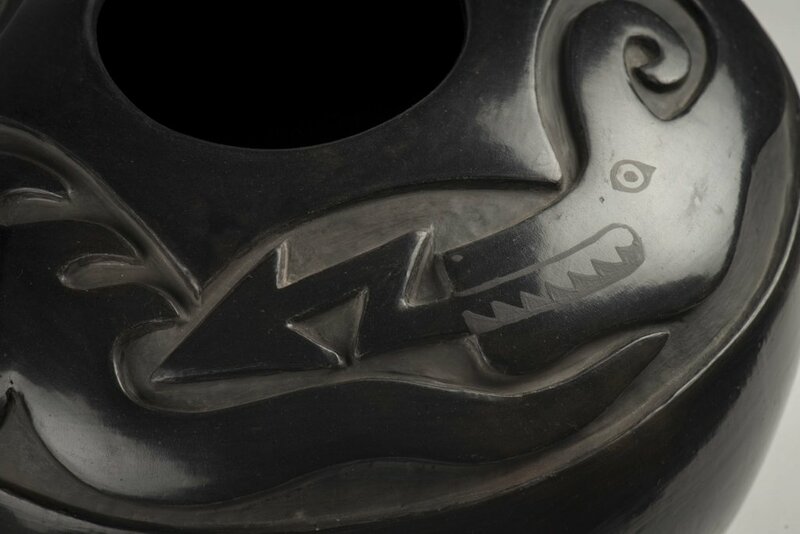 The Tafoya family also preserved myths and legends within the repetitive compositions displayed on their pottery. 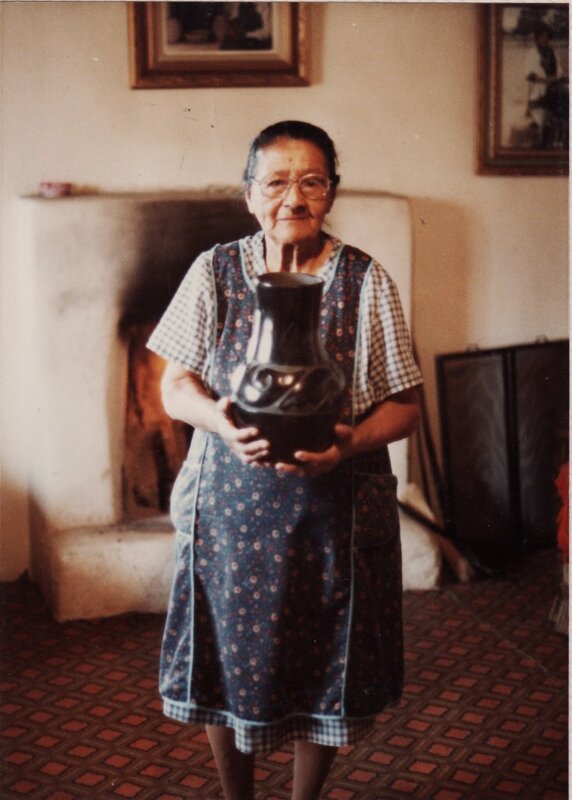 The bear paw is directly accredited to Sara Fina, and continued on today as a revered family tradition: the eldest matriarch of the Tafoya clan able to adequately construct a large storage jar is granted the right to create the largest bear paw on their creations. The bear paw symbol comes from an old legend stating that during a time of drought a bear led the people to a fresh water spring and saved them. As Margaret explained, “The bear always knows where the water is.” Sara Fina was also the first to experiment with carved designs on clay, and it was Margaret who expanded this incised style to what it is known as today. 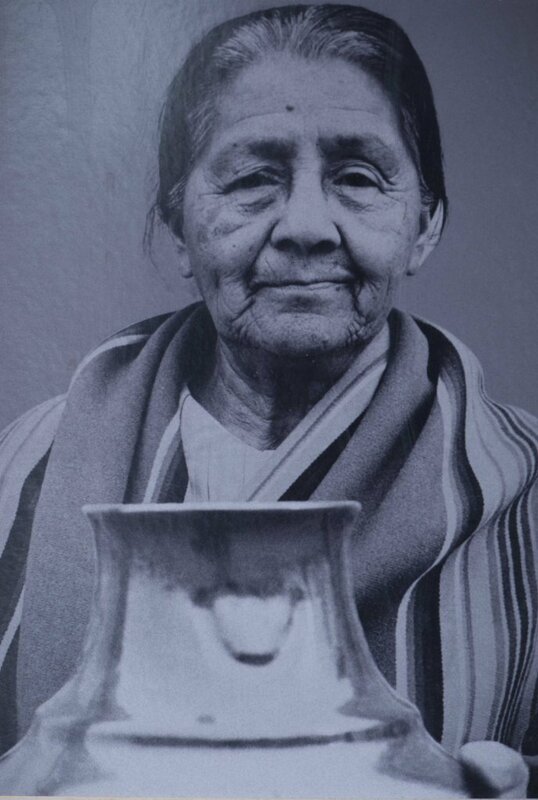 Sara Fina had a profound impact on her descendants and laid the foundation of the Tafoya family’s pottery techniques in the 1900’s. These cherished processes and designs have been carried on 120 years later to today with members of the family adding their own individual styles and creative techniques. Margaret Tafoya stands out within this dynasty as a powerful and highly respected American Indian matriarch and guardian of historic practices. Her goal was to maintain the connection her mother initiated: grasping on to and nurturing their culture and values; Margaret did this with fierce determination, skill, and vision. Margaret Tafoya with jar, photo taken by John Krena in Margarets home. The way we live becomes who we are. Sara Fina and Margaret Tafoya knew this and spent their lives fighting for the opportunity of their children and their people to stay who they are. Mothers to their children, mothers to their people, and mothers to their way of life, they loved, nurtured, protected, and inspired the world with their passion. The pottery they leave behind serves as a reminder to us all to nourish and defend the cultural values that make us who we are. If we don’t, who will? 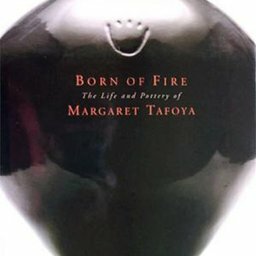 Born of Fire: The Pottery of Margaret Tafoya at the Ceramics Research Center in Tempe, AZ!